Hurricane Sandy the Frankenstorm Is Coming: Do You Have Flood Insurance? With Hurricane Sandy poised to hit U.S. shores early next week, people all along the East Coast are remembering Irene, Katrina, Ike and Hugo. But this one could be even worse. The storm has already killed at least 21 people in the Caribbean, and forecasters are warning that it could turn deadlier if, as expected, it merges with a cold front -- a possibility that's already been dubbed "Frankenstorm." That's why we've dug out some advice about flood insurance that DailyFinance reporter Sheryl Nance-Nash compiled last year when Hurricane Irene came calling. Considering that four out of every five natural disasters nationwide involve flooding, while less than a fifth of U.S. homeowners have a flood insurance policy, it's advice too many of us still need. 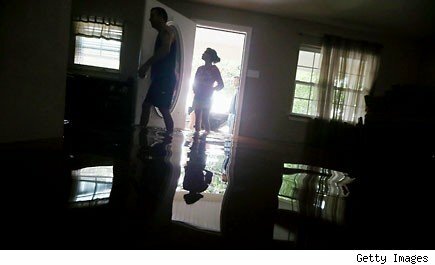 "People tend to underestimate the risk of flooding," said Jeanne M. Salvatore, senior vice president and consumer spokesperson for the Insurance Information Institute, in a prepared statement. "But, in fact, 90% of all natural disasters in this country involve flooding. It is important to note that there is a 30-day waiting period for flood insurance to go into effect, so don't delay purchasing this important financial protection." A miscalculation can be costly. The average annual U.S. flood losses in the past 10 years were more than $2.7 billion, according to data from the National Flood Insurance Program. Maybe you're thinking you're covered by your standard homeowner's policy -- you're not. Or, maybe you think flood insurance is outrageously expensive -- also untrue. According to the Insurance Information Institute, the average flood insurance policy in 2010 was $594 a year for $220,577 worth of coverage, while the average amount of a flood insurance claim was $26,067. You can find out your risk of being affected by a flood and the cost of a policy at www.floodsmart.gov. The No. 1 misconception when it comes to flood risk is that some people are in a "flood zone" while others are not, points out Janet Scott-Buckley, manager of Harrington Insurance Agency. "Everyone is in a flood zone. Even lower-risk areas can experience a flood. The question is: Are you in a SFHA (Special Flood Hazard Area) or not, and does your community participate in the National Flood Program?" Low risk is not the same as no risk. "Even those who do not live in an area at high risk for flooding should talk to their agent or company representative about getting flood insurance," Salvatore said in a prepared statement. "Since the inception of the NFIP, 25 to 30% of the NFIP's paid losses were for damage in areas not officially designated as special flood hazard area at the time of the loss." Flood insurance isn't exotic: It covers the direct physical losses resulting from heavy or prolonged rain, melting snow, blocked storm drainage systems and levee dam failure, and they company that issued your renters or homeowner's policy likely also provides it. You can also get coverage from the NFIP. "Aside from obvious flood threats (i.e. flood zone, coast, etc. ), there is no hard and fast rule to guide a decision on whether to purchase flood insurance. Each property owner needs to assess their risk based on a variety of factors, including topography, proximity to a flood zone or coastal area, personal financial situations, mortgage lending requirements, etc. My advice: When in doubt, get the coverage. While federal flood coverage is limited to $250,000 and may not fully cover an entire loss, it is better to have some protection than none at all," says Alex Winslow, executive director of Texas Watch, a nonpartisan citizen advocacy group. Sandra Knight, deputy federal insurance and mitigation administrator, recognizes that for many of us, money is especially tight these days. "We know that for homeowners -- especially in this economy -- any additional expenses can be difficult, and may seem unnecessary if they have been lucky enough not to experience a flood," she wrote in a blog last year. "But, like insurance we purchase for our cars, or our health -- flood insurance is meant to protect us from the much greater costs we could incur if a flood did hit. We hope homeowners that do purchase flood insurance never have to use it, but it is a critical means of protecting your property and loved ones against a hazard that hits far too many communities around the country each year. The consequences can be personally and financially devastating." Robin Westcott, Insurance Consumer Advocate for the state of Florida, concurs. "Because flood insurance is generally relatively inexpensive, for most people it is affordable, so I encourage people to look at getting the coverage," Westcott says. "You may need it, you may not, but because it's affordable, you can err on the side of caution." When dealing with flood insurance, understand that an insurer's definition of certain words is not the Webster's definition, warns Mark Carrasquillo, personal insurance agent with E.G. Bowman Company. "It's the insurance version that will determine coverage. Many consumers, when discussing or describing a loss think that the words flood and water damage are interchangeable and by all rights, mean the same thing. Wrong!" says Carrasquillo. "In the insurance world, they are different. Same damage result perhaps -- nevertheless, they are different because of how the damage was caused," he explains. Flood, by definition (give or take a few words) is described as "the sudden rising or overflowing of surface water (inland or tidal waters) tides, tidal waves, spray" explains Carrasquillo. In a nutshell, water damage is everything else -- the result of the breaking or cracking of any part of an appliance or system that contains water: The water heater, a baseboard or steam heat system, shower pan, toilet, etc. Also, water backup from sewers and drains. However, he says, water damage coverage must be added through a special endorsement: It's generally excluded from the standard homeowners policy. Know too, that in insurance-land, the definition of a basement may not be what you think. For insurance purposes, a basement is any space below ground on all four sides, "If you have to step down into your house, even if it's only four inches," says Carrasquillo, that counts as a basement. He says his "basement" is accessible through both a front door and a rear door. It has been finished as a den/family room. However, he must step down in order to enter the house -- therefore, that area counts as a basement. "My furniture, built-in bar, clothes closet, etc., are not covered in the event of a flood," says Carrasquillo. "If your basement is finished, the contents are not covered, even if you have contents coverage." However, if you are able to walk out of the "basement" onto level ground without taking a step up, it is not considered a basement, says Carrasquillo. Many people purchase flood insurance thinking that it will cover their finished basement and its contents -- carpets, TVs, furniture, etc. -- if they get water in their basement, says Scott-Buckley. However, to have the policy respond at all, the event must qualify as a flood-loss based on very specific guidelines, and there are many limitations on what is and is not covered in a basement (most of those "finished basement" items mention above are not). "If you are one of the people who tends to get "water in the basement," there are some options," says Scott-Buckley. "If you have a sump pump, you can usually buy an endorsement on the homeowners policy that protects against loss due to sump pump failure/overflow." What will happen, will happen, but being prepared can make a difference. So while you're stocking up on bottled water, food and what you need to batten down the hatches in case Mother Nature pays you a visit, don't forget flood insurance.